Shawn talks about the crash and burn of the space sim genre. Welcome back! In part one of our interview with Shawn of Star Wraith 3D Games, we discussed his background, his previous and current releases, and the design philosophies he’s clung to during his career. In this installment, Shawn looks back at the demise of the mainstream space sim, and where the genre has gone since. Enjoy! Brian: You’ve not only been a part of the game creation scene since the heyday of space sims beginning in the late 80s, but you’ve been there through it’s rise in the early 90’s and fall in the late 9os and early 2000s. What are your thoughts and reactions to this rise and fall of the space sim genre, and what do you think contributed to its demise? Shawn: Looking back on the final years of the space-sim boom and the games released at the time (both space-sims and non space-sims) indicates what likely brought about its decline. And in my opinion, its not entirely the fault of the space-sim games themselves (I’ll touch on that more in a bit). Sure, there were some changes that probably had a significant negative impact on the appeal and ‘fun’ factor of space-sims for much of the fanbase (and I recall reading discussions in forums at the time about these very things). For example, the formula for what made a great space game was being shifted in a couple of directions that seemed to divide the fanbase through efforts to provide a broader appeal and/or unique features. Some ‘revolutionary’ concepts to facilitate those goals were implemented and unfortunately, some of the most important qualities of a fun space game were sacrificed or at least reduced in favor of such new attributes. You probably know what I’m referring to… ranging from forced control limitations to limited tactical maneuvering options (flat 2D options in what is supposed to be a fully 3D environment)… from trying to out-sim the other sim to severely limiting gameplay options for ‘splashy’ story events. It wasn-t necessarily bad per se, just reflective of what was going on at the time in the minds of developers, players, and publishers. I certainly enjoyed several of the games at the time (and still do for a few of them), and there were benefits in this search for ways to expand the genre. Many of the games received positive press and brought in a few new converts from other genres for a little while. But unfortunately, the new directions generally did little to garner much interest from the very audience the games were supposed to appeal to. The short term gains could not reverse the long term effect. Lackluster sales and waning interest obviously occurred. Some could argue (and rightly so) that such changes were done, at least in part, in response to the already falling interest in the genre in attempts to revive it. But whether it was too little too late or part of the cause, or both, the end result was still a collection of games with limited appeal to the broader space-sim audience and a significant reduction in the genre as a whole. However, the ‘demise’ was not caused by the games alone. In fact, I’d step out and say the games themselves played a somewhat secondary role in the overall decline in the genre. The primary cause was probably just shifting gamer interests. And that shifting was the result of an explosion in the FPS market. Many gamers even left the PC entirely in favor of new consoles that became available. Along with these changes came a preference for either WASD+mouse or twiddle-your-thumbs gamepads. The fancy joysticks they once used were shelved in the closet as they migrated to the latest shooter. Over the years as the shift in interests came about, many gamers lost their tolerance for learning complex control schemes and gameplay options, preferring instead the ‘instant gratification’ of managing just a few on/off keys and a view control with rapid fire wack-a-mole action. It’s something space-sims could never really compete with given their condition at the time and those that tried by attempting to hybridize the two concepts received little interest from either gaming group. Many of my friends who were once avid space-sim fanatics are now regular FPS players. I have certainly been disappointed by the decline in space-sims, but it hasn’t dampened my interest in playing them or making them. And the changes in the genre have, in several ways, improved the quality, gameplay, and variety available. The quantity has obviously decreased significantly over the last decade or so. But the newer games, while fewer in number, still provide the genre with some great gameplay along with advancing it in terms of technology and options. In some ways, I think the genre is probably now just overlooked in some ways. In my opinion, the genre still has a lot to offer gamers, especially in terms of gameplay depth, variety, and long term fun. Brian: Has the demise of the big-name published space sim put any extra pressure on you as an indie developer, especially as one who has helped keep the genre alive? Shawn: Perhaps, but I don’t really sense additional pressure from the perspective of ‘now it’s up to me’. Instead, there seems to be a focus benefit where because of my involvement in working to try and keep the genre alive, I’ve been able to fine tune my projects for the changing trends and player preferences that have surfaced in recent years. Expectations and interests are something I carefully monitor and try to adapt my games to accommodate in conjunction with my design goals for my projects. As one might guess, feedback is an important part of that equation. Being part of it all is something I really enjoy as an indie developer. Brian: If you could pitch a space sim to a big developer, how would you sell it to them? Shawn: I would likely open with presenting a series of examples illustrating the epic feel and diverse controls available in an environment that offers the capability of the biggest opponents possible and ‘go anywhere’ to attack or escape options in the only true fully open 3D setting. I would go over the essentials of what makes a great space-‘sim’ and emphasize the importance of avoiding the pitfalls of trying to appeal to everyone by sacrificing the essentials. Give the player freedom, control, offense/defense options, complexity, and depth. Give them room to progress. Don’t hold them back with forced limitations in these areas. You don’t have to hammer them with complexity and a learning curve shaped like the rising US deficit. Start things out simple, but give them plenty of room to grow and build a diverse tactical toolset to succeed in the game. The average space-sim gamer may surprise you… they are smart, able to adapt, enjoy mastering complex machines, and aren’t afraid of a real challenge. This might fracture their preconceived notions of what a space-sim is and should be, showing that what they think would be ‘fun’ in a space game could risk turning away much of their target audience who has a very different idea of what is fun to them. Brian: Finally, if you were trying to introduce someone new into the space sim genre, how would you go about it, and which games — besides yours, of course — would you use to get them interested in the genre? Shawn: That would really come down to the individual and requires a carefully formulated subjective answer catered to that person. I’d initially ask a lot of questions about what kind of games they enjoy, platforms they prefer, how/if they want to interact with other players, and the controls they like the most. Depending on their answers, I might direct them to a game like Black Prophecy, X3 Terran Conflict, FreeSpace 2 (yes, even after all these years), or Freelancer. 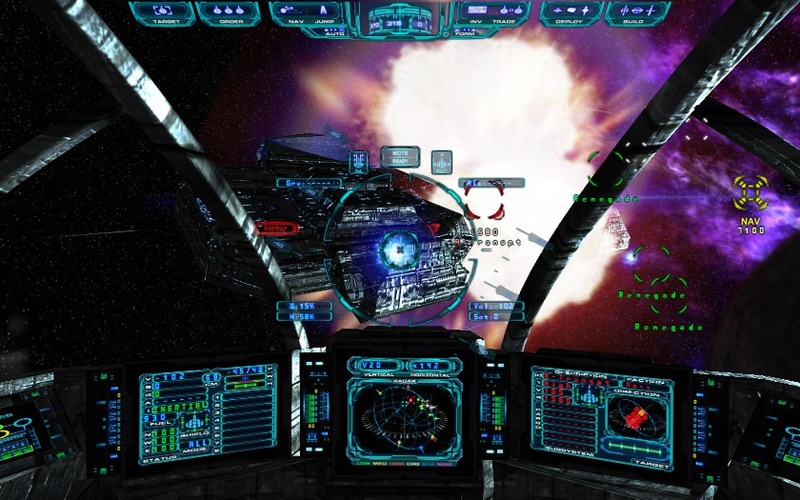 Some might not even be interested in a first person perspective game, preferring instead a more fleet/external tactical approach, so I might recommend something like Gratuitous Space Battles or StartPoint Gemini. And that concludes our interview. A big thanks to Shawn at Star Wraith 3D games for taking the time to answer my questions so thoroughly. I hope you enjoyed the interview, and thanks so much for reading.